Strange. If he had said “European” or “American” or even “Australian,” I wouldn’t have minded so much. But the idea of an invasive South African plant making a home in my New Zealand garden had me going for the secateurs right then and there. It didn’t take long for me to question my distorted response. This plant didn’t support apartheid; and anyway white rule ended a generation ago. Why didn’t I see this leafy lodger as a symbol of the multicultural hope of southern Africa’s future rather than its overtly racist past? Dog of likely southern African descent poses with plant of possible southern African descent. Part of my flippant response came from the current Kiwi mania for native gardens. And I’m guilty as charged. In a land of wilding pines and rampaging sycamores, it’s important to keep native flora in good nick, in order to support native fauna. But I suppose I also imagined that this exotic fellow was planted years ago by the home’s former owners—lovely people who probably had no problem associating the Commonwealth of Nations with the commonwealth of gardens. Old memories die hard. In the late 80s or early 90s, while backpacking in Europe, I became acquainted with two white women from South Africa. I remember they weren’t as impressed as I thought they’d be when I told them I had read two of Alan Paton’s novels. But what I remember best was a young black man joining us and, discovering where the women were from, angrily denouncing them. “I can go anywhere in the world except your homeland. Why is that? Why do you allow that?” I had seen the ongoing protests in front of the South African embassy in Trafalgar Square, and yes, I had read my Alan Paton. I knew something of Steve Biko and Nelson Mandela, and I wholeheartedly agreed not to play Sun City. But this man’s outburst brought home the injustices that I hadn’t really been able to conceive. It’s easy to criticise South Africa’s recent past, but I wonder if history will be so harsh—or so kind to the rest of the ‘first’ world. After all, apartheid lasted only a few decades longer than legal segregation in the US and White Australia Policy. Courageous organisations like the National Union of South African Students and the South African Student Organisation opposed apartheid for years before most outsiders even knew the word. And plenty of leaders in our ‘free’ world were only too happy to look the other way and keep collecting those gold Krugerrands. New Zealanders have a particularly bad case of amnesia when it comes to our settler brethren across the Indian Ocean. We celebrate the protests against the 1981 Springbok rugby tour of New Zealand as a moment when Kiwis stood up to racial intolerance. But we rarely speak of all those previous tours of South Africa, when Māori players were not allowed visas. Or the fact that, only five years earlier, thirty African nations boycotted the 1976 Olympics as a protest against New Zealand—yes, clean green New Zealand—for allowing the All Blacks to continue playing in South Africa, despite widespread condemnation of apartheid. No white hands are clean. When I mention the 1976 boycott to New Zealand friends, most seem embarrassed and simply profess that it was a different and a very divided time. But younger people, who usually have some understanding of the fabled Springbok tour, haven’t heard much about these earlier, murkier events. Memory can play tricks on us; monuments offer a less ambiguous testament to a culture and its values. Across Australia and New Zealand, grand sculptures call attention to an earlier moment that bonded our nations with South Africa: the Second Boer War. In an earlier post I suggested that we should think about soldiers as a particular kind of migrant worker. In the late nineteenth century, soldiers from Canada, Australia, and New Zealand crossed the ocean in order to help the British Empire claim more of southern Africa. They weren’t there to fight the aboriginal people but rather to assist one settler community (the British) to defeat another settler community (the Dutch). They were also there to support (perhaps unwittingly) the trading interests of maverick entrepreneurs like Cecil Rhodes. 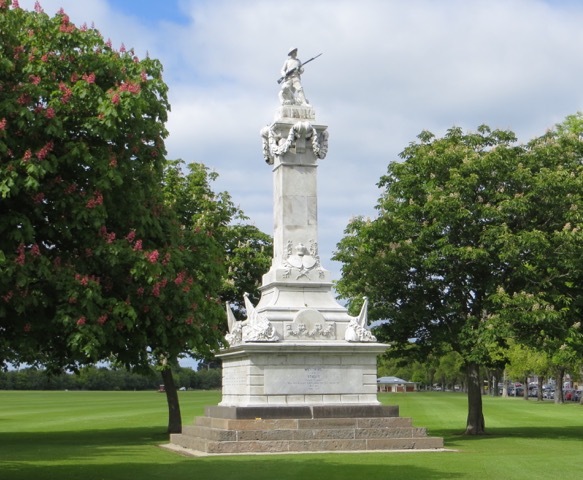 Monuments to the Boer War appear in almost every major centre in New Zealand and Australia. Two of the most impressive are in Dunedin and Adelaide. The Dunedin monument rests at the corner of a great expanse of green on the west side of town. Its position makes it difficult to miss but also difficult to appreciate. Cars zip by in several directions, and pedestrians are few. Those using the park are unlikely to trek to the otherwise uninteresting corner. Yet historically it is a key marker of Otago and New Zealand identity. It marks the first time New Zealand sent military migrants en masse to another land to fight for the empire. And the work is fittingly monumental. The pedestal announces this as a “Memorial to Otago’s Fallen Soldiers, who Died in South Africa, under the Flag, during the Boer War. 1899 – 1902.” The names of fallen privates appear on one side; officers occupy the other. A wide base gives way to a column decorated with garlands, flags, and symbols of empire, on top of which appears an Otago soldier protecting the body of a fallen comrade. This, at least is the official reading of the monument, though I wonder how many viewers assume the fallen figure is an enemy soldier. But whether read as a commemoration of conquest or selfless courage, there is no reference to the moral ambiguity of the war itself—a war incited by the discovery of gold and diamonds in the South African Republic—nor to the camps where thousands of Boer men, women, and children died under the most appalling conditions, nor to the native peoples effaced from this scene of remembrance. Still, the inclusion of a cadaverous figure at least calls attention to the reality of war, and the ambiguity of the fallen figure suggests a parallel between the Boer and Otago dead. 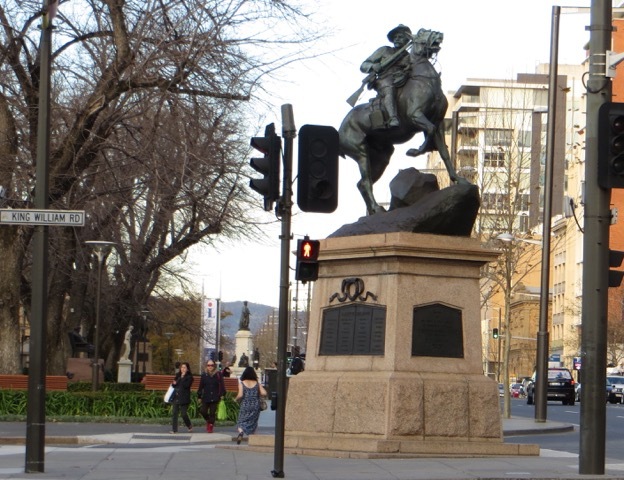 Adelaide’s South African Boer War Memorial stands near the centre of town. It commemorates “the Valour of the Citizen Soldiers of the State who fought in the South African War 1899-1902” (Federation occurred in 1901, so the soldiers would have departed the colony of South Australia and returned to the independent nation of Australia). It’s a dramatic and romantic work, capturing an Australian fantasy of the mounted bushman and his powerful horse. If Dunedin’s monument dampens the memory of war through its location, Adelaide’s seems designed to forget the specific past and celebrate a mythic one—there’s no immediate indication that this image celebrates men who fought overseas (and the most notorious South Australian soldier—Breaker Morant—is nowhere to be seen). Neither of these works seems to engage the twenty-first century public in the way the many statues of Queen Victoria divide Australians and New Zealanders. Like street names that commemorate imperial battles, they’ve blended into the cityscape. But perhaps that will change one day. After all, these monuments stand as reminders of our nations’ willingness, even enthusiasm, to send young men and noble animals to the other side of the hemisphere in order to defend and expand British settlements, and to promote an ideology that favoured white British rule—an ethos that encouraged widespread racism in Australia, New Zealand, and South Africa. To the unsuspecting tourist or local, these monuments stand ready to launch a surprise attack on one’s cultural memory. These days it’s rather passé to link the three southern settler lands. Sport has replaced war as our key cultural connector. In New Zealand, at least, we depend on Asia for international trade, and we more often look to the Pacific for the future of our art and architecture. But large numbers of white southern Africans have migrated east in the past 25 years, and their accents have become as familiar on the streets of Perth or Auckland as those of Scots and Canadians. And soon, I hope, they will be joined by more of their black countrymen and women. Perhaps then we can have a more thorough discussion of the complex and troubling history that will long connect our lands. Meanwhile, back in the garden, I’ve decided to keep my unexpected visitor. His ancestors have probably lived in the neighbourhood a lot longer than I have. And, in a final floral twist, I’ve learned that my visitor (Echium pininana by name) comes from the Canary Islands. 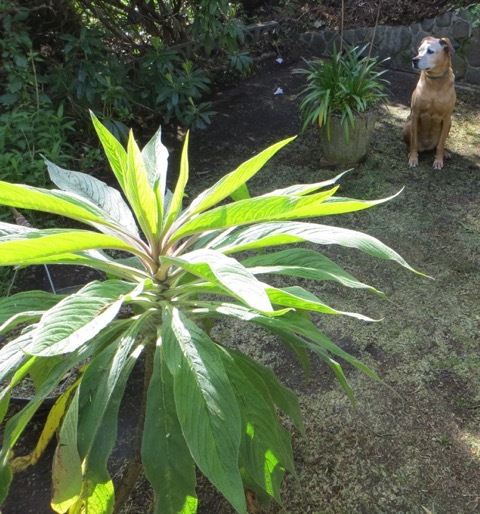 If I treat my Echium well, it will flower dramatically and bring the birds and the bees to my backyard. Thanks, Steph! I certainly will.